Such a Scorpio under the influence of the sensitive Goat becomes softer, more sensitive, but by no means weak-willed person. This most powerful and domineering of all representatives of the watermark remains true to itself under any circumstances. But the timid, indecisive Goat begins to believe in himself, learning to confront difficulties and problems. People of this combination are distinguished by courage, independence, and they are cheerful and carefree. Sociable, get along well with others. According to the combined horoscope, Goat-Scorpio is a strong, uncompromising personality with a hard character. Sometimes frivolous, but always charming. She has a talent to please people, everyone around her is happy, even if she acts solely in her own interests. Energetic, stubborn Scorpio-Goat boldly goes to meet his dream. It acts boldly and decisively: it does not recognize any half measures, it does not compromise. This is an unusually strong personality, ready to fight to the end. However, due to its charm, Scorpio-Goat does not have to make sacrifices for the sake of success: people are always happy to help him. After all, he is so sweet, charming and benevolent. Surrounding people often underestimate him — this is a talented manipulator and a good strategist. The artistry of the Goat in combination with the strong will of Scorpio is the main secret of success. In addition, nature has provided these people with the ability to anticipate future events. However, sometimes they are so impatient and not organized that they make upsetting mistakes and stupid mistakes. The union of the fearful Goats and the strong-willed Scorpion gives its representatives a complex, controversial character. Recognizing their true nature is quite difficult: these people do not like to share their secrets. Although, perhaps, they themselves do not fully understand themselves. In Goat-Scorpio, several individuals peacefully coexist. Its manifestations are diverse: cruelty and sentimentality, will and lack of character, practicality and recklessness. One thing remains unchanged: absolute self-confidence. 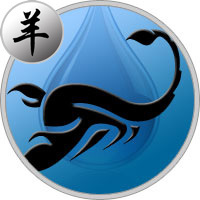 Whatever passions rage around, whatever contradictions tear Scorpio-Goat apart, he remains true to his principles. He does not listen to the opinions of others, is not afraid to be alone: ​​his own interests are paramount. Charming, funny Scorpio-Goats are always in the center of attention, have the talent to attract people. Easily adapt to the interests of others, are able to please and make a good impression. However, such behavior only shows their pragmatism and worldly wisdom. They are natural leaders who lead people. They consider that they have the right to make decisions for others, they perfectly feel the mood of those around them, skillfully control their actions. The main feature of the sign Scorpio-Goat — uncompromising. Not prone to long disputes, firmly insist on their own. They are arbitrary, unpredictable and categorical in their judgments, but still very attractive: they have powerful energy. Temperamental, charismatic Scorpios-Goats rarely get bored alone. They hold freely and independently, which is quite natural for them. Crowds of fans are invariably attracted to themselves. In personal relationships, they manifest themselves as loving, frivolous partners. Perhaps they are striving for marriage, but according to their behavior this cannot be said. According to the love horoscope Scorpio-Goat is a selfish, authoritarian partner. Looking for bright emotions, new impressions, seeks to get maximum pleasure. Unfortunately, thinks little about the feelings of beloved. Having entered into marriage, Scorpio-Goat becomes just an ideal family man, or rather sincerely tries to be one. Poor loneliness, needs the support of loved ones. She is looking for warmth, eager attention: she loves to shine even with her family. For her part, she tries to surround her loved ones with love and care. Although sometimes it makes high demands on them, it waits for unquestioning obedience. Scorpio-Goat enthusiastically manages the lives of their loved ones: he writes the script, directs and, of course, expects gratitude. An extravagant and indecisive Goat, having felt the support of Scorpio, shows wonders of efficiency: reaches enormous heights in his career. The union of these signs is extremely fruitful. Scorpio is responsible for pragmatism and dedication, and Goat seeks to realize his creative ambitions. Therefore, people of this combination feel confident in any field of activity, many professions are subject to them. Among Scorpio-Goat there are writers, artists, actors, educators and scientists. For a single-minded, hard-working Goat-Scorpio, there is only one serious obstacle to success: one’s own laziness. It would seem that this energetic, decisive person is able to cope with any difficulties. It has a strong intuition, which saves him from mistakes, differs in resourcefulness and ingenuity, which allows you to instantly respond to the situation. However, Scorpio-Goat has bouts of apathy and laziness, but even during this period he finds the strength to command everything around him. This is a natural leader, not able to obey and follow someone’s instructions. Scorpio-Goats men are energetic, purposeful people. They like to solve complex problems, although they often neglect their official duties, work according to their mood. Selfish and self-confident, even the most formidable bosses will not be able to force them to act against their will. But they themselves manipulate people perfectly. These are powerful men, rather scornful towards surrounding people, including their fans. And women literally deify charismatic Scorpions-Goats, their natural magnetism and sexuality can not leave indifferent even the most strict, discerning ladies. In love relationships do not differ loyalty and constancy, often change partners. Communicating with Scorpion-Goats women — a complete pleasure, but living with them is much more difficult. They are interesting, intelligent companions, a bit impulsive, but this only gives them fascination. However, in a love relationship Scorpio-Goat women are capricious, selfish, unpredictable. They like to drive men mad, and they do not do it on purpose. They simply can not fully understand their feelings and desires. They are stubborn, hardworking, but at the same time lazy and irresponsible. Emotional, sensual nature can be cold, prudent, if it comes to the need to make a choice. They will be able to find happiness with a man capable of condescendingly treating the quirks of these beautiful, unpredictable persons.